For the uninitiated, the Moomins are a family of cute and cuddly white trolls that live and play together in Moomin Valley. Created in Finland 1945 by Tove Jansson, the Moomins have appeared in countless comic strips, books, films and TV series, the merchandise is extensive and in 1993 their very own theme park opened. Moomin World, near Turku in Western Finland, is a great destination for families with children under seven years-old and earlier this year my wife and I surprised our daughters, aged five and two, with a trip to this Moomin paradise. We live in Helsinki, so we had a 90-minute direct train journey from the capital and then stayed over-night in one of Turku’s many hotels. The main hotels share an hourly bus service to and from the park (5e per adult, 3e for over-threes and free for under-threes) and there is plenty of room for the dozens of pushchairs that are wheeled on-board. After the 30-minute bus journey, there is a free Moomin road train that transports you a short distance to a long walkway that finally takes you across the water to the Moomin World island – if you think the journey there is long, just wait till you return with exhausted children! In 2010, there were two ticket choices for everybody over three years-old: a One-Day Bracelet (21e) and a Two-Day Bracelet (28e) – under-threes are free. I recommend purchasing a One-Day Bracelet because, even in the height of summer, you will easily complete the park in the six hours of opening time. The free map thoroughly deceives you over the size of the park leading you to believe the centre-piece, the Moomin House, will be a long walk, but it is just 500 metres from the entrance. Moomin World is nothing like Disney World or other traditional amusement parks. There are no rides to queue for and there is no irritating music being played over the PA system, but there is still plenty for little visitors to enjoy. The theme park has caves, houses, fantasy paths, short nature walks, the Moomin Boat and lots more for children to interact with and immediately access. The focal point of the park is the five-storey blue Moomin House that visitors can explore from bottom to top. The house contains Moominmamma’s kitchen, Moominpappa’s study, bedrooms, play rooms and a jam cellar in the basement. The house is great fun to explore, although some of the staircases could be a little challenging to smaller children. 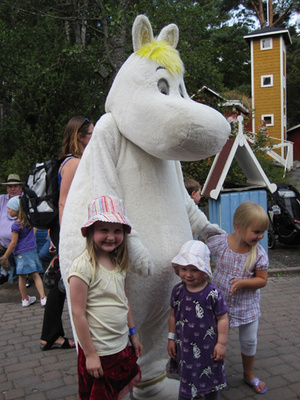 The number one reason to visit Moomin World is the meeting, hugging and stroking of the Moomin characters. The primary place to meet the characters is outside the Moomin House and they are incredibly accessible. Children are free to spend as much time as they wish with each character and are free to let their little hands explore the furry creatures. One disappointment was the difficulty in photographing only my children with the characters and not having two or three other children posing as well. There are at least three costumed characters, plus their human character handlers, on show at all times and all the handlers speak excellent English – the Moomins are silent. I was worried that not understanding Finnish or Swedish would be a problem, but all of the signs have English translations and the staff can communicate extremely well. The two main Moomin shows in the Moomin Theatre Emma are only presented in Finnish and Swedish, but they are simple enough for young children to understand so adults will have no problem following the storyline. Food, snacks and ice cream on offer in the park are rather pricey, but that is something you almost expect when trapped on a theme park island. We took our own picnic and drinks and used one of the many tables to feed the children cheaply and with food they would certainly eat. One ice cream stand allowed the children to sprinkle their own hundreds-and-thousand and squirt on the sauce, which really made their day. Despite being almost 20 years old, Moomin World is clean, safe and perfect for young children. It can get a little boring for adults as you stand around waiting for the kids to move on to the next activity or show, but in your heart you know it is all worth it. I was very impressed with Moomin World’s fresh approach to the theme park idea and would wholeheartedly recommend it to families with young children, but just be prepared for a full-scale assault on your wallet in the gift shop!